Cottage-style home with a modern twist. Walking distance to shopping and trailheads. Large outdoor space (deck) great for entertaining with Jacuzzi/Spa. Fenced yard for your four-legged friends. Stunning dark hardwood floors throughout, with lots of windows to bring in the natural light. Bright and airy master bedroom with Dutch door for deck access, in-suite full bathroom with washer and dryer. Inviting living area, cozy places to sit by the fire. Kitchen has a modern feel with newer appliances; farm-style dual deep sinks, garbage disposal, dishwasher, propane stove. Spacious second bedroom with French-doors leading to the outside deck. Guest bathroom off the living area. Successful vacation rental with good rental history, great ratings and reviews. 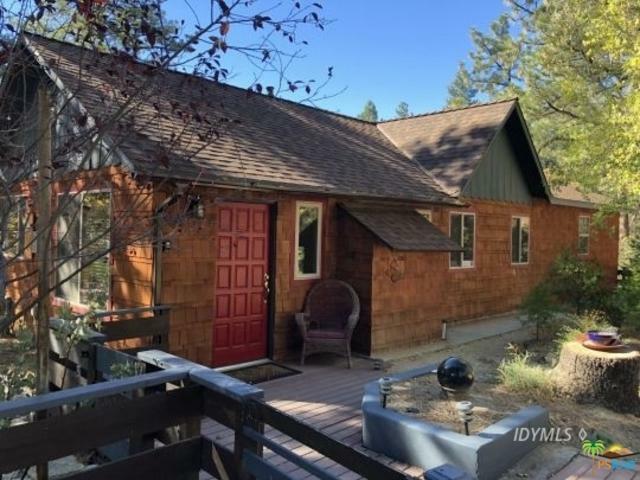 Listing provided courtesy of Rick Martinez of Town Real Estate - Idyllwild.